Made for a true son of Scotia in Exile; a Cameron through and through. 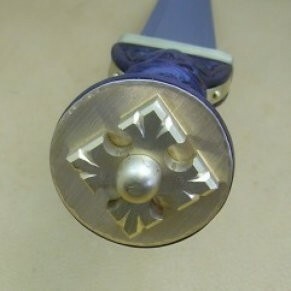 (He had his first Clan Badge pinned to his blanket when he was born...) He wanted a Jacobite era dirk, but one with a slightly different combination of handle carvings from what he had seen before. We discussed it and decided to combine features from several historic pieces. Mr. Chambers and I offer for your perusal -- Sean Chambers' Dirk.